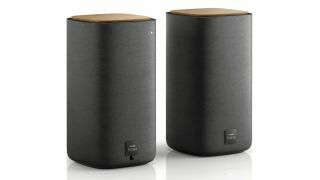 Philips has unveiled its E2 Fidelio Wireless Studio hi-fi speakers, a slick pair of pillars hoping to pump some serious sound around your living room. Design-wise, they remind us of the Fidelio E5 (minus the satellites). Each classy pillar features a soft-dome tweeter, alongside an integrated 4-inch woofer and bass reflex speaker system. Oh, and a nifty tap-controlled volume rocker on the top too. You'll be able to stream music from your phone or tablet via Bluetooth or, if you're so inclined, pair up with NFC. Philips tells us that the E2 will be available this spring for a price of £299/$299 (about AU$335). Joining the E2s is the small but spritely BR-1X, which is going for the rugged look and offers indoor and outdoor modes. Dual 2-inch drivers mean the speakers should pack a fairly powerful punch despite their size but if you need to call in more power, the BR-1X speakers can be "daisy chained" together. Indoor mode brings deeper bass and better clarity, while outdoor mode will pump out a louder sound for those garden parties. They'll be available in the UK this month with a price tag of £99.99 and will arrive in the US in February for $89.99 (about AU$100).